Cairo 1973. British intelligence agent Lucy Vickers is on the run, her cover blown. Her colleague Mark Bellamy has just dumped a dead policeman and a Mercedes in the Nile. Can the former lovers salvage the secret mission that has brought them together on the eve of war with Israel? Or are they throwaway players in a game of Cold War politics? As Lucy and Mark are reeled into a net of treachery, there is only one person to turn to: The enigmatic Egyptian-Armenian private eye Pierre Farag, who seems to be a step ahead of their every move. Cairo Mon Amour is a gripping Cold War thriller and a poignant love story, woven around the first days of the Yom Kippur War. Stuart Campbell is a former university Pro-Vice Chancellor and Professor of Linguistics. Nowadays he writes quirky novels about love, betrayal and redemption. Stuart was born in London but has lived in Sydney for many years. I read this book cover to cover in three nights, loved every page, couldn't put it down. Going back to a time I vaguely remember my father flying Shackletons for RAF Coastal Command, and as a young man being fascinated by his stories on return to RAF Luqa in Malta. 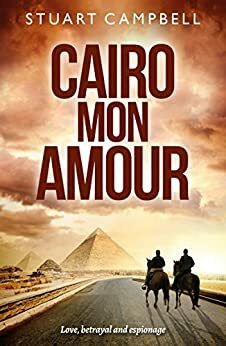 I was totally captivated by the central characters in Cairo Mon Amour, the mood created, and really hope the author will develop the key characters into a second book! Very highly recommended!. With all that is happening in the Middle East, this charming book took me back to gentler but no less fascinating times, in Egypt. A love story interwoven with danger and espionage, the various characters in Cairo Mon Amour captivated me. A very enjoyable read. Does the author have plans for a sequel? 5.0 out of 5 starsWonderfully entertaining. Mr. Campbell transports the reader to Egypt and then proceeds to build an intriguing tale based on actual historical happenings. As with the last book I read by this author, I found it hard to put down. A rich sense of setting with mysteries within mysteries which are slowly exposed like Russian nesting dolls (Matryoshkas). The writing is clever, witty and, always, sensual. Each one of the unique and unforgettable characters has something to hide, and what is hidden is skillfully revealed. I found it interesting that I could identify more or less with each of the viewpoint characters. Looking forward to reading more of this author’s work. An occasional visitor to Cairo I found his descriptions of the city and its precincts astutely and artistically rendered. Whether in affluent Zamaleck or el-Arfra (the City of the Dead) he engages us allowing us to walk with his characters entering, as it were, an impressionistic Cairo transformed by the emotions and plight of the players. His work reveals familiar places, at a different time and under different social and political circumstances. 5.0 out of 5 starsTour de force success. I loved it! Stuart Campbell’s latest, Cairo Mon Amour, is brilliant in so many ways. There were times, while reading this novel, that I felt as though I was being pushed out onto a narrow gangplank. I couldn’t breathe, then I gasped for breath. I suspect this reaction is exactly what the author has in mind for readers. Setting and atmosphere are stunning. There’s a piece when main character, Pierre, asks of the man who delivered a message – Who sent it? I laughed out loud at Pierre’s second thought. “It was useless, of course. [to ask] But that was the beauty of it: A client could arrive stark naked with their envelope and who’d be the wiser?” This reaction hints at a culture so unabashedly different from my own that as I laughed, I was momentarily knocked off center. The author captures a circuitous way of communicating truth to the reader and this method is a powerful device throughout the novel. I won’t soon forget the way the characters packed the boot of the car for a one-hour trip to the pyramid. It was priceless and it brings up another wonderful detail of Campbell’s writing – his lavish description of food! Metaphors such as – tough as a sheep’s ear and someone who smokes like a slaughterhouse bonfire – sparkle off the page. When Pierre tells Mark that Cairo is not the place for him – “You English like to see life in neat slices, like a sandwich on a nice white plate. We’re not like that here. My life is not like that.” – this philosophical reflection encapsulates the entire book. Certainly, nothing in this novel is neat or served up on a white plate. Tour de force for Stuart Campbell. I loved it! 5.0 out of 5 starsPick up a copy, you won't be disappointed. I thoroughly enjoyed Cairo Mon Amour. The writing is top notch, the setting unusual and brilliantly realised, and the characters beautifully drawn. For people of 'a certain age' this will evoke memories of a time before mobile phones and the internet, What was I doing in 1973? Couldn't possibly say. Mr Campbell's sharp and incisive prose covers a period in the Middle East that is often mentioned in the history books, but rarely alluded to in modern fiction. The book is a tour de force. I can't wait for the promised sequel. I highly recommend CMA to all readers who enjoy a great plot, beautifully written. Pick up a copy, I promise you won't be disappointed.